The realities of working as an early learning educator in 2018. Underpaid and overlooked: The reality of working as an early learning educator in 2018. They’re the people many parents rely on the most, particularly in the early years of their child’s life. The people who devote their time to looking after children so their mums and dads can return to work or have some time out for themselves in their busy lives. They’re the people that children rely on to teach them, raise them, play with them, comfort them, feed them, help them to get to sleep during nap time and show them how to make friends, how to respect others and how to develop skills that will see them through their lifetime. But that’s certainly not all. We know the list could go on and on because that’s the true value of early learning educators. Yet despite playing such a vital role in our families and communities respectively, early learning educators – 97 percent of whom are women – are among the lowest paid professionals in Australia, earning as little as $21 an hour. Early learning educators are among the lowest paid professionals in Australia. Image via Big Steps. It&apos;s a pay gap that exists predominantly due to that fact that early education has always been seen as &apos;women&apos;s work&apos;. Work that has been "undervalued when it&apos;s performed in the home and continues to be undervalued when it&apos;s performed outside of the home", according to Helen Gibbons, the assistant national secretary of worker&apos;s union United Voice. Gibbons tells Mamamia that early learning educators&apos; poor pay is "just not okay". "These are incredibly important people who continue to be overlooked and undervalued. Earning $21 an hour massively restricts your life choices, and it&apos;s a bit of a saying in early education that when you want to have your own children, you have to leave because you can&apos;t afford to be working in early education and raising a family," Gibbons explains. The pay gap, which sees early learning educators pocket almost half of the nation&apos;s average salary, is an issue that has plagued the industry for decades. It has also sadly caused a number of educators to leave their jobs prematurely, or deterred individuals with a passion for working with children from entering the industry at all. United Voice&apos;s Assistant National Secretary, Helen Gibbons. Image via United Voice. There is significant turnover in early education, which is not only a shame for the educators themselves, but the families they work with. "Every parent knows a story of their favourite early learning educator leaving the centre and how distressing that is for a young child and for the family when their favourite educator is no longer there to welcome them in the morning," Gibbons says. "Parents and children develop such strong trust relationships with these educators and they&apos;re qualified, experienced and committed, and they&apos;re trusted by the families. Any single one of them leaving is a tragedy. That we have higher turnover in the sector than we do in other areas in our community is a waste of time, money and resources and it&apos;s a waste of talent." It&apos;s for this very reason that a large proportion of early learning educators have come together to launch the Big Steps campaign as members of United Voice. These educators are calling on the government to fund professional pay for every educator. A request they deserve to be granted. 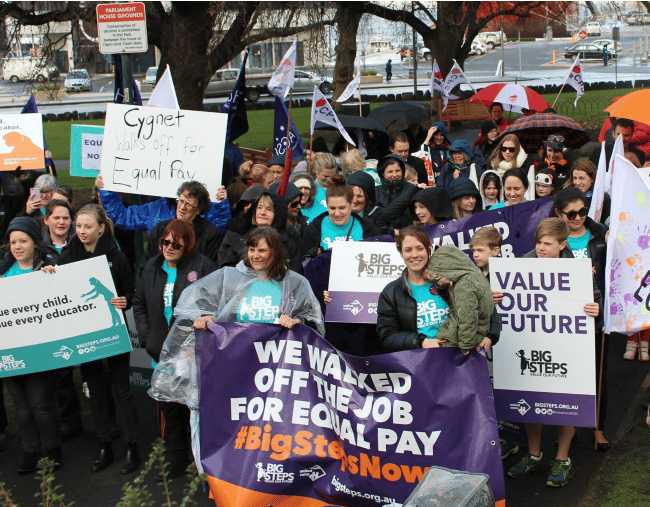 In September of last year, thousands of early childhood educators walked off the job at 3.20pm, a time chosen because they say it&apos;s when they start working for free due to their low wages. This strike action saw 10,000 families impacted, having to make other arrangements for their children to be looked after. This was their second strike action within a matter of months after more than a thousand early learning educators walked off the job on 2017&apos;s International Women&apos;s Day. It&apos;s an issue facing the Turnbull Government that Gibbons believes is escalating. "This is getting bigger and bigger and it&apos;s really getting to crisis point," she continues. "If that&apos;s what it takes to get the government to listen then that&apos;s what the educators are going to have to do." Through their struggle, early learning educators have discovered that they have an enormous ally in this campaign: parents. Gibbons explains, "Every time educators have walked off the job they have done so with extraordinary support from parents who frankly are inconvenienced but are supportive anyway because there&apos;s nobody that values an early educator more than a parent." That&apos;s why when it comes to supporting early learning educators, there is something that mums and dads everywhere can do. Parents can register to support the campaign on the Big Steps website for Keep Your Children at Home Day (March 27), to show their support for educators walking off the job. With educators and parents coming together to put pressure on the government, we can only hope that fair pay is achieved for those who contribute so much to the lives of children, yet are currently being given so little in return. Are you an early learning educator? Or do you have one in your child&apos;s life? Tell us about your experience. This content was created with thanks to our brand partner, United Voice.